Join us for the FIRST FULL MOON PADDLE of 2019; called the "flower" moon. This event falls on Saturday, May 18th and is sure to fill up (being the weekend) so book soon. We will meet at 5:45 pm, gather together for a special spring meditation first and then enjoy a magical sunset paddle with hopes to watch the moon rise! Please bring a flashlight, headlamp or lucid solar lamp that you may attach to your person or board. Space is limited. Reserve soon! HALA gear and now hydrus boards are available to order from us!! Is a new paddleboard on your (or a family member’s) 2019 wish list? Support your local small business and let us hook you up with the right gear at an awesome price! All new gear comes with a $50 gift certificate toward lessons. What’s not to love? Look for our SPRING 2019 demo day announced soon! Contact for details or click the link below to learn more. Beginning EARTH DAY, join us April 22nd, 24th, 25th and 26th for a week of SUNSET ECO-TOURS! A percentage of each tour will be donated to local organization, EarthShare NC. EarthShare NC was founded in 1991 by a group of nonprofits with the goal of connecting more people and resources to the conservation movement. We'll meet at 5:45 pm at Jordan Lake (location to be emailed at time of registration) and paddle until dusk. Your guide will determine best paddling route based on wind and sunset view. This time of year, we have a good chance of seeing eagles, osprey, great blue herons and other critters! Photos included! It’s the best job in the world. Loving what you do, teaching others to do it. One of the 1st paddleboarding schools in the region, we've made it our mission to spread the JOY of paddleboarding to as many people as possible. 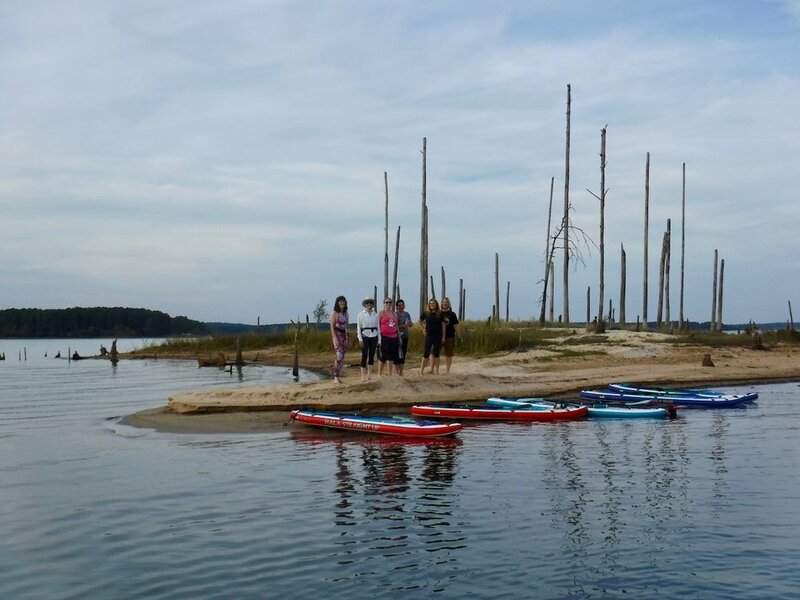 Since 2013, we have offered the very best paddleboarding classes in the triangle area. From beginner Standup Paddleboard (SUP) lessons, pro SUP coaching, SUP yoga and meditation classes to corporate team building, tours, clinics, camps and retreats, we have classes for everyone! LYF SUP has taught hundreds of people including groups from IBM, Duke University and UNC. Our rates are affordable, INCLUDE QUALITY EQUIPMENT and small class sizes ensure students are safe and get the most out of their instruction. LYFSUP is one of only a few ASI (Academy of Surfing Instructors) ACCREDITED SUP SCHOOLS in the USA! Additionally, your LYF SUP instructor has decades of experience teaching on and off the water and is certified to coach standup paddleboarding by the sport's leading athletes and organizations. Certifications include: WPA level 1, Paddlefit Core, ASI SUP/SUP Yoga, CPR/first aid, water rescue, and we are registered/certified through Yoga Alliance (RYT 500/ERYT 200). Small class sizes ensure safe teacher:student ratio and our clients leave with vital water skills that will stay with them for life. As an ambassador for this growing sport, it is LYF SUP’s ongoing commitment to YOU to spread the joy of SUP safely and effectively! In the world of SUP, you generally get what you pay for, which is why we invest in top-notch equipment. Not only will you feel safe, stable and agile on our HALA, RED, SOL and Jimmy Lewis boards, you'll appreciate our paddles made by expert craftspeople with lightweight virtually indestructible materials. In our classes, students learn how to identify quality equipment, so that they can make good future investments...or just keep using ours. LYFSUP is dedicated to protecting our earth. We organize beach clean-ups and donate annually to causes that protect our water & natural environment. Standup paddleboarding has been said to be the fastest growing water sport in the world for good reason. Learning to SUP will improve balance, focus, coordination and body strength in a beautiful setting. It’s versatile; it can be a serene and peaceful form of gentle exercise or more physically challenging depending on your purpose and mood. But the main reason is that Standup Paddling is FUN, easy to learn and anyone can do it! SUP Yoga combines standup paddleboarding with the practice of yoga. Since our boards are stable and sturdy enough to act as floating yoga mats, it will seem natural to strike a pose on the water! The element of water will require you to engage additional muscle stabilizers, maintain balance, concentration and add a sense of playfulness to your practice. You’ll have a whole new relaxed perspective when you take your yoga to the H2O. We love to explore! Whether it be an eco tour, special event or one of our popular retreats, all of our paddleboarding adventures will ease you away from the hustle of life, providing you and your group with the perfect combination of relaxation and fun. We’ll bring the boards, paddles, everything you need (we’ll even take some action shots of you on the water). All you need to bring is your sense of adventure! *Interested in booking with us? Have a question? Fill out the short form below & You'll receive an email from us. Thank you for getting in touch! We spend a lot of time on the water. Please allow 24 - 48 hours for us to respond. You'll receive an email from us ASAP.